The global telecommunications market has undergone considerable change in the past few years, with a shift in the importance of various services – from fixed, wired networks to mobile networks, and from voice services to data services. The shift has also been prevalent in the South African market, where mobile services revenue has overtaken that of fixed-line services, and demand for high-speed, affordable data is expanding rapidly. 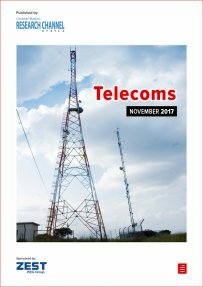 Creamer Media’s Telecoms 2017 report reviews South Africa’s telecommunications market and the major companies operating in the sector. The report provides information on the country’s voice and data communications, network investments, international connectivity and corporate activity in the sector. It also provides an overview of policy and regulatory developments in the sector. The report is a summary of information published in Creamer Media's Engineering News and Mining Weekly over the past 12 months, as well as information available in the public domain and does not purport to provide analysis of market trends. Published on: 03 November 2017.